As summer turns to autumn there are predictable behaviors we regularly encounter when the seasons change: American football starts, birds fly south for the winter, and the leaf peepers flock to New England. Leaf peeper is an affectionate term for a person who travels in the fall to visit areas wooded with deciduous forests to view the changing color of the leaves. 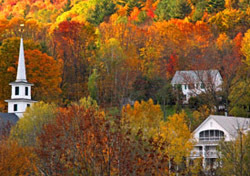 The most popular destination to view the autumn foliage is in New England. Where is New England? It's the area on the northeastern coast of the US that consists of the states of Maine, New Hampshire, Vermont, Massachusetts, Rhode Island, and Connecticut. It's one of the earliest English settlements in the "New World" (North America). Ironically, "to peep" is to look quickly and furtively (secretively) at something which is the opposite of what leaf peepers do, but the words sound agreeable and fun together so this humorous name is how those tourists are identified. If you are considering becoming a leaf peeper yourself, you can get the autumn foliage reports at leafpeepers.com or YankeeFoliage.com. New England takes leaf peeping seriously!